Celebrating the hundredth day of the school year is a big deal in lower elementary classrooms. I liked to celebrate with learning centers all revolving around the number 100. I’ve included one of the center activities along with a fast finisher activity in my freebie. Happy 100th Day of School! 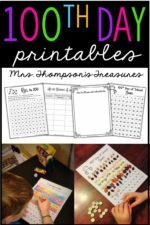 Click here to grab your 100th Day of School Freebie!